Bob Yaciuk, Leader of the Trillium Party of Ontario, attended the Black Community Leaders Debate on April 11th despite not being invited. Lucia Guerrero (Humber River-Black Creek) and George Garvida (Scarborough-Guildwood) accompanied Bob to the event. The organizers of the event are the Operation Black Vote Canada or OBVC. When Bob entered the Jamaican Canadian Community Hall, he was approached by security and told that he was not allowed to speak or to interact with anyone in the room or he would be removed from the building. The snub was not expected, as the Trillium Party is recognized as the Fourth Party in Queen’s Park, having a sitting member from the Carleton-Mississippi Mills riding. The Green Party has no representation in the Ontario Legislature, but were headlined in the advertising of the event. 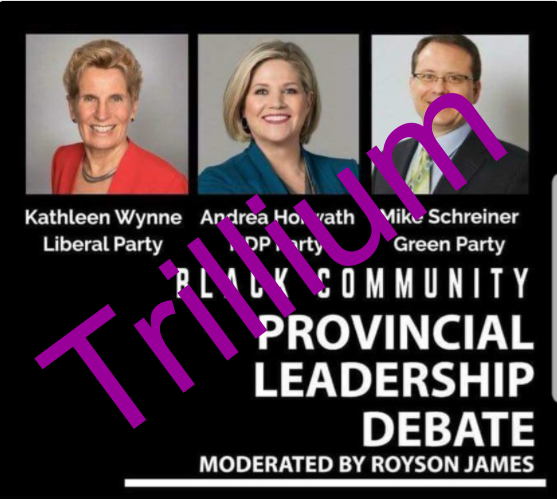 The Trillium Party is known for it’s stand on equality and acceptance of all communities in Ontario, and has stood up for many of the minority groups already, both in the legislature, and at community events. Bob did manage to hand out a few “Trillium” business cards to some who attended outside the venue. Bob was invited by GBKM.FM radio to attend a media session panel that included Kathleen Wynne after the debate was over. He is very grateful to George Fogap and the GBKM.FM radio team for allowing him to participate. Uploaded by GBKM TV on 2018-04-12. GBKM.FM will be doing a full interview with Bob on their show on APRIL 28th from 11:30am – 12:30pm. Please tune in.